I’m man enough to admit it. Christian Ponder is my starting quarterback. But it’s a 16-team league, and there are about 30 quarterbacks owned throughout it. I made the mistake thinking I could bank on Russell Wilson late in the draft. 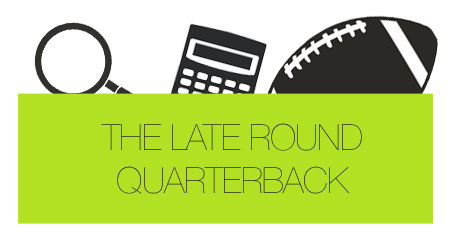 In round 11, where I had hoped to get Wilson, there were ten quarterbacks chosen. Ten. Backups on backups on backups. Wilson was clearly one of them. I ended up getting Christian Ponder and Alex Smith. So this is what it feels like to be a Minnesota Vikings fan, huh? Instead of pouting and drinking myself silly, I’ve decided to take this Ponder selection and use it as a case study. I want to show you all that, even if you end up taking an absolute, God awful fantasy quarterback late…you can still win your fantasy championship. I was in the 5 spot in this 16-team draft. I got DMC, the snake came back to me and I somehow landed Julio. Then, in the third round, 37th overall, I snagged Jimmy Graham. I don’t really know how that happened, but I took it. Sincerely, it’s the first time I even considered getting a tight end early. In the 4th round I selected Dez, and followed that up with the Ridley and Ingram picks. The rest of the team just kind of fell into place from there. Yet, one week before the 2012 NFL opening kickoff, I have Christian Ponder as my starting quarterback. I’ve got more depth than a Warren Buffett portfolio, but my quarterback position looks like the Umbro-wearing homeless dude who lives down the street. I’m now on a quest. I have one week – 7 days – to get rid of Christian Ponder. I will use my depth, and potential starters, to do so. Throughout this week, I’ll post a daily recap on all Ponder happenings, showing you all that, even if you have a brain fart and screw up your draft with the late-round quarterback strategy, all can be right in the world. It’s time to put on my cape, pack up my weapons and put on a diaper. This is about to get crazy.